A while back I promised you a recipe for my cast iron skillet corn bread. Well now the time has come to deliver on that promise, but before I share that recipe with you, I thought I would tell you a story. My dad was born in the middle of the great depression. He was child number 9 out of 12 for my grandparents. Can you imagine trying to feed that many mouths during good times, let alone during one of the longest economic downturns that our country has ever seen? I know what helped was the way that they lived. They had a vegetable garden, and raised their own meat. They had a milk cow for milk and butter, chickens, and hogs and they had land they could farm. During the toughest of times, my grandfather and the eldest son went away to find work at a logging camp out west. Growing up, I heard many stories about my dad's childhood. Those stories would come from various family members and it gave me a real insight into how life must have been during that time. During one visit with my grandmother's sister, I remember discussing cornbread. That family was known for their good cooks, and great recipes, so talking about food was not uncommon. My dad mentioned making cornbread with milk and eggs. His aunt just looked at him and in the way she would always draw out her words she said "oh honey, you weren't brought up that way." She went on to explain that they were too poor to make cornbread with anything other than water and cornmeal. My dad just smiled and gave me a wink. He didn't argue with her. He knew that there was a time that cornmeal and water was probably the only way they could make cornbread, but he also knew that when the ingredients were to be had on their farm, milk and eggs were added as well. I haven't tried my great aunt's version of cornbread, I'm thinking that it is probably a hot water cornbread. This recipe is going to be more than just cornmeal and water and I can tell you that this version is very tasty! Even my cornbread hating husband loves this one. Simple ingredients make for a delicious and cheap recipe! So here are the ingredients. You might be asking yourself, "what is in that jar?" Well that is my secret ingredient and what my grandmother always used, to make her cornbread. Bacon grease. I know what you are thinking...heart attack waiting to happen, but the bacon we use is from grass fed pigs. When I save the grease, I strain it so it is "clean." And honestly, it gives the cornbread so much flavor. Trust me. See, that bacon grease doesn't look so bad! Turn the oven on to 350°F. 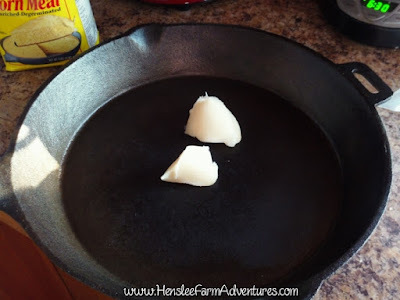 Put two spoonfuls of bacon grease, or about 1/4 cup of oil in your cast iron skillet and then put the skillet in the oven. 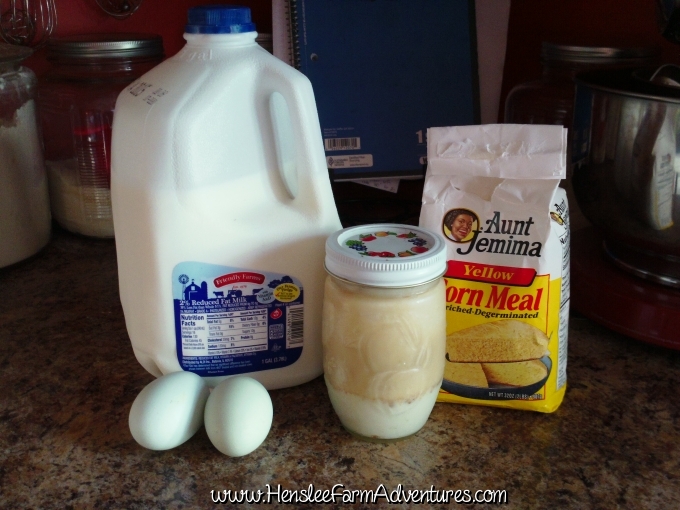 Next mix together 2 cups of cornmeal, 2 eggs, and 1 1/2 cups of milk. 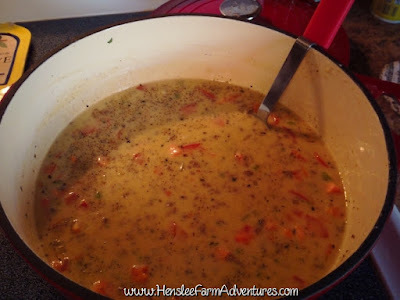 You can use sweet milk or butter milk, whatever you have on hand. Mix well. 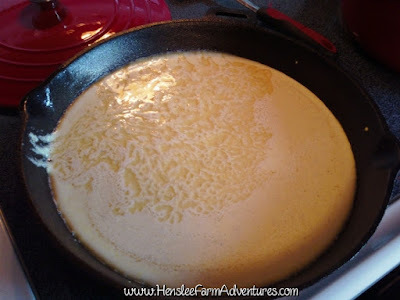 Once the oven has preheated and the skillet is nice and piping hot, take it out of the oven and pour a little bit of the grease or oil into your batter and stir. This is the batter ready to be baked. Thanks to the hot pan, it has already started to brown around the edges. Then pour the batter into the skillet. It should sizzle as it hits that pan. Turn the oven up to 400°F and put the pan back in the oven. Bake for 15-20 minutes or until golden brown. And here is the finished product! This was so good! I love cornbread, especially with chili, or beans, or a hearty soup. I even love it as a dessert with honey drizzled on top. 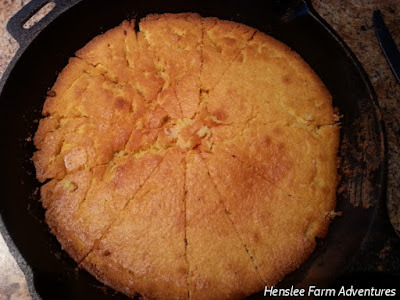 Want to know what we ate with this cornbread? Cheeseburger soup! I'll share that recipe with you very soon! This was unbelievably good! One of our family's favorites! 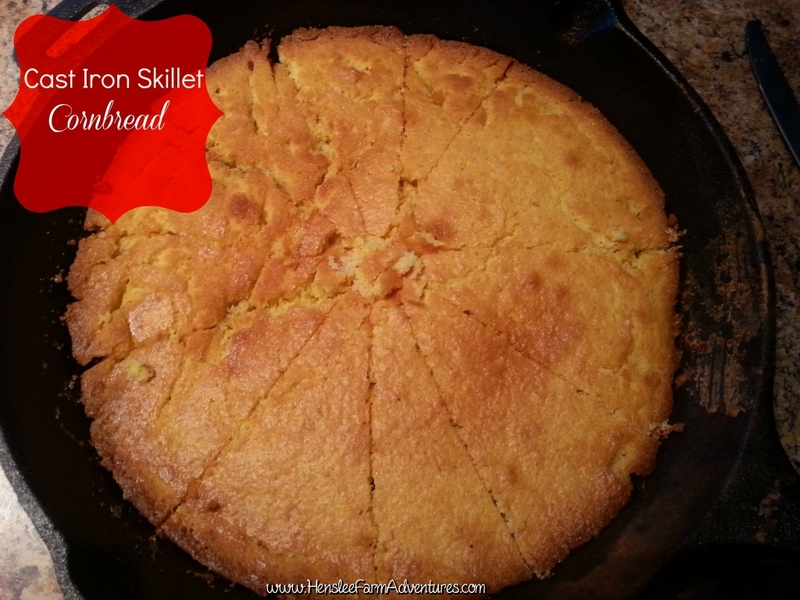 I hope you enjoyed this easy iron skillet corn bread. If you want the printed version of the recipe, then click HERE. Let me know in the comments how you make your cornbread.